The previous-generation Honda Civic Type R was a real favourite among driving enthusiasts but ended production in 2010. A replacement has been eagerly awaited for some time and now Honda has confirmed the latest-generation model is scheduled to be launched in summer 2015. Pictured above is a partially camouflaged development prototype, but we can expect the production model to feature a similarly sizeable rear spoiler, ground hugging front spoiler and quad exhaust tailpipes. Expect some tasty alloys, too, likely to be a minimum of 19 inches in diameter to accommodate enormous brakes. Under the bodywork, the Civic Type R will be the first Honda model in Europe to be fitted with the company’s powerful new ‘Earth Dreams’ turbocharged VTEC (Variable Valve Timing and Lift Electronic Control) petrol engine. It’s a two-litre 2.0-litre four-cylinder unit which will be paired with a traditional six-speed manual gearbox – there won’t be any automatic or semi-auto paddle shift options. Honda says the engine will generate ‘in excess of’ 276bhp (though figures closer to 300bhp have been rumoured) and will be compliant with the latest European emissions standards. Since it’s turbocharged the new engine won’t be quite the same in noise or character as the rev-happy VTEC engines of old, but nonetheless Honda is aiming for it be one of the highest revving turbo engines in production. 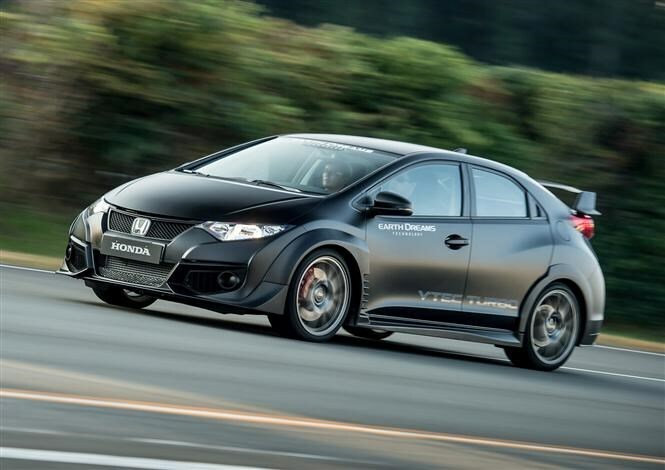 Like the regular Honda Civic production car, the new Type R will be available in front-wheel drive form only. Also likely to be included on the production car is an ‘R’ driving mode button, which sharpens the throttle response, makes the traction control system more accommodating, firms up the suspension and makes the steering more heavily weighted. Lower and wider than the regular car, the Type R will be available with adaptive dampers with various settings to allow a mix between ride comfort and maximum agility. Speaking of agility, Honda has been testing heavily at the famous Nurburgring Nordschleife circuit in Germany, where it aims for the Type R to set a time faster than eight minutes. This would make it the fastest front-wheel drive production car yet to be timed there. That record is currently held by the Renaultsport Megane RS 265 at eight minutes and eight seconds. Should it achieve a sub-eight-minute time, that would also make the 2015 Honda Civic Type R more or less as fast as the famous Honda NSX-R sports car. There’s still a year of development to go but expect the new Type R to be a hot hatch force to be reckoned with. We can’t wait to drive it. When we do, you’ll be able to read our full 2015 Honda Civic Type R review right here.